With beautiful weather coming into bloom, you will find you and your special someone spending more time outside the house, socializing with family and friends. When you are breaking out of the drab and dreary winter there is nothing like showing off your style with a new piece of sparkling jewelry and watching it glitter in the sunlight. Celebrate a spring or summer birthday, Mother’s Day or anniversary by giving her a piece of jewelry that is personalized specifically for her with her birthstone. Each month of the year has a birthstone and each gemstone has a specific meaning and history. According to the Ameican Gem Society, there are numerous legends about birthstones having healing powers and even a therapeutic influence. In fact, some people believe that wearing the gemstone associated with your birth month will heighten the stone’s abilities. If you or your special someone was born in May, your birthstone is the emerald. 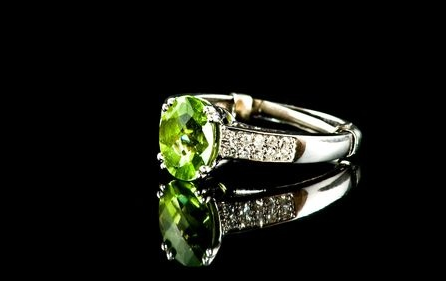 Emeralds are thought to symbolize rebirth and can grant you good fortune, foresight and youth. Not only are emeralds a beautiful choice for a birthday gift, they also can be considered a great gift in recognition of Mother’s Day. Find a vintage necklace or ring adorned with an emerald and truly make her day shine. June babies are lucky to have three choices for their birthstone – pearl, alexandrite and moonstone. While pearls are an ancient symbol of luxury and are the only gem from a living creature, alexandrite is a relatively modern gem with the ability to change colors in certain lights. The moonstone is also an exceptionally popular choice, especially in India where it is believed to bring good luck. All three are beautiful choices for a piece of fine jewelry! If you are one of the many couples to have gotten married in July or celebrate your birthday during the month, consider a gift featuring the month’s gemstone – ruby. Rubies are thought to arouse the senses and stir the imagination. Plus, they are also said to grant you great health, wealth, wisdom and success in love, making them perfect for both birthdays and anniversaries. End the summer right with a birthday gift she will always remember – a pair of earrings or bracelet featuring one or both of August’s birthstones – peridot and sardonyx. While peridot is said to bring the owner power, influence and a wonderful year, sardonyx is believed to imbue a person with courage and victory. Featured in a modern-style piece of jewelry, these gemstones will be adored by your August-born special someone. No matter the occasion, Frank Pollak and Sons can help you find the perfect gift of jewelry featuring spring and summer birthstones. Find fine quality vintage or modern jewelry from necklaces and rings to earrings and bracelets. You’ll receive specialized care as you search for the birthstone jewelry that is will have special meaning for that special person. Talk to our friendly team by calling 800-342-3878 or stop in and see us on Fifth Avenue in New York today. ← What’s in Style this Season?